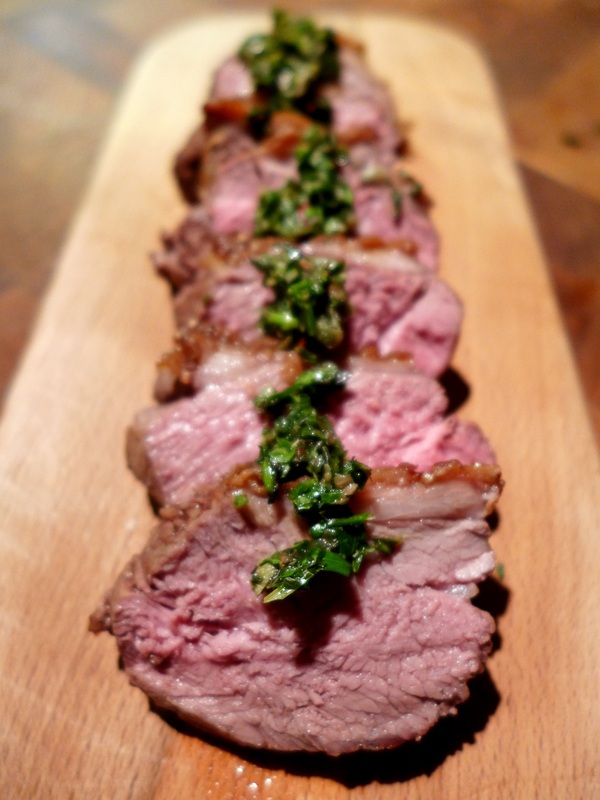 I used lamb rump here but you can just as easily use chops or lamb steaks. And there are many variations on salsa verde: tweak and taste until you have something you like. It would be lovely with a handful of wild garlic chopped into it, if you can find some. Swap the tarragon for basil if you prefer it. The important thing is that it’s green, herby and pungent. A culinary aside: there are few things more irritating than reading recipes calling for hard-to-get ingredients so I’ll say up front you don’t need Turkish chilli flakes or Catalan anchovies for this dish. If, however, you can lay your hands on some pul biber (also known as Aleppo pepper) and anchovies from l’Escala, they will make you a very happy cook. Pul biber are mild, almost sweet-tasting chilli flakes and l’Escala anchovies are big, plump and juicy and a far cry from the skinny little things you usually get in tins. You’re welcome. 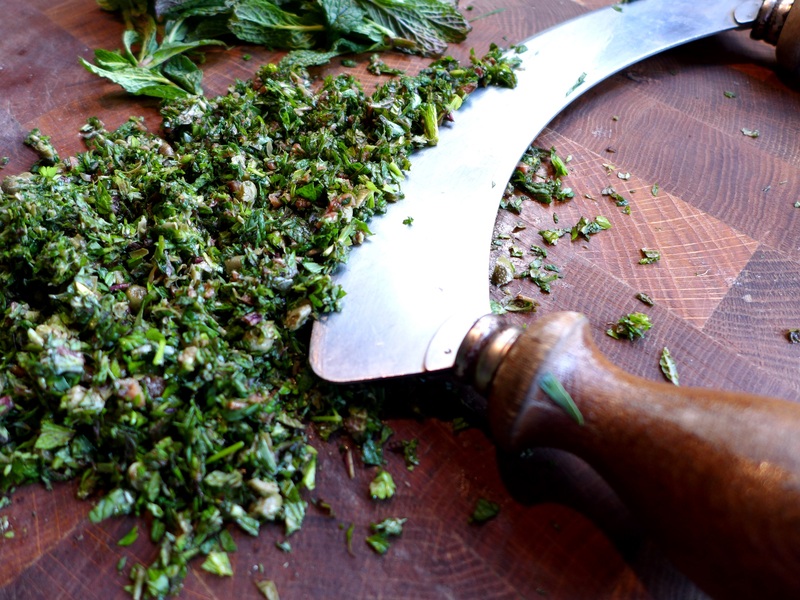 Make the salsa: pile the herbs in a heap with the capers and anchovies and chop finely, but retaining some texture. I would suggest you don’t overdo the tarragon, as it can dominate. Place in a bowl, add the crushed garlic and a few chilli flakes, if using, and enough olive oil to form a thick sauce. Check the seasoning and add a squeeze of lemon and a little salt and pepper, if needed. Just before serving, add another sprinkle of pul biber to the top for a bit of colour and garnish, but set the sauce aside for now for the flavours to meld. Put the podded broad beans in a pan of boiling, lightly salted water, lower the heat and cook for three or four minutes until just cooked. Drain and once cool enough to handle, pop the beans out of their skins. If you’re using lamb rump, pre-heat the oven to 180C/350F/Gas Mark 4 and trim the lamp rump of any random bits of fat but leave some on for cooking. Score the fat on top in a criss-cross pattern with a sharp knife. Season well, then put a heavy-based oven-proof pan on the hob until it’s very hot and add 1 tbsp of oil. Cook the lamb fat-side down until it’s colouring, then turn and quickly sauté on all sides until nicely browned. Drain off any excess fat, place in the oven for 12-15 minutes, depending on how pink you like it, then remove. 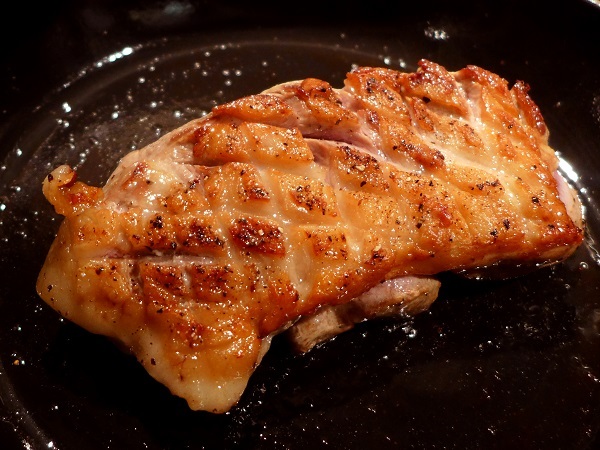 If you’re cooking chops, rub them with a little oil, season well with salt and pepper and grill, griddle or barbecue until browned on the outside but still pink in the middle, about 6-8 minutes per side depending on their thickness. Either way, allow the meat to rest somewhere warm while you finish the beans. Put the beans back in the cleaned pan with half the olive oil on a low heat and mash roughly, bringing back up to heat. Off the heat, add the remaining olive oil, lemon juice and chopped mint, stir well and season with salt and black pepper. 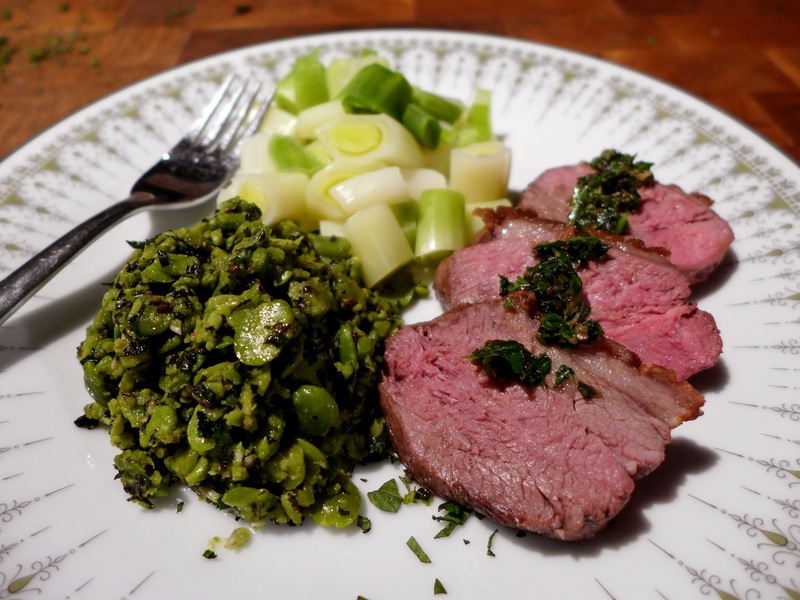 To serve, pile a heap of the crushed broad beans on each plate, slice the meat thickly (if using rump) and spoon over a little of the salsa verde, with the rest in a bowl for people to help themselves to more. New potatoes are good on the side, as are steamed leeks. Any leftover salsa will keep in the fridge for a few days. 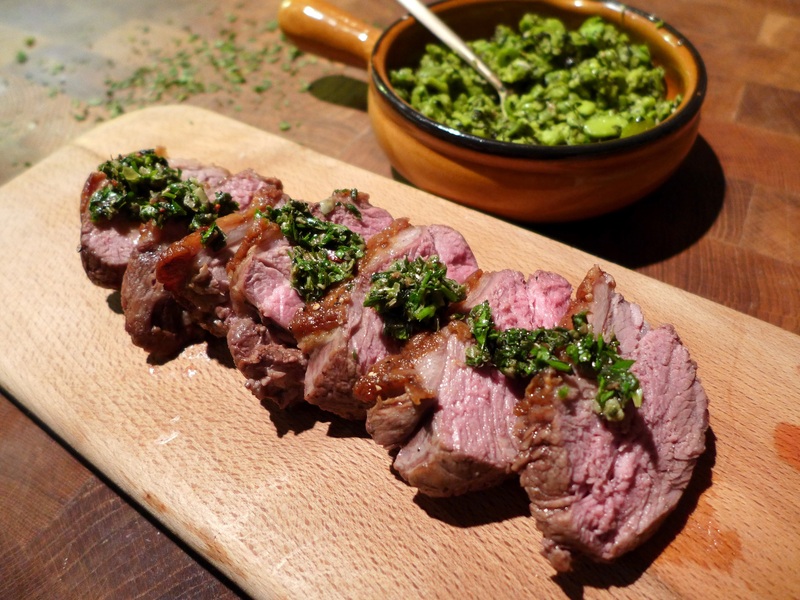 This entry was posted in Lamb and kid, Mains, Sauces, Vegetables and salads and tagged crushed broad beans, lamb with salsa verde and crushed broad beans, salsa verde, spring recipes by Linda Duffin. Bookmark the permalink. More broad beans! Jealous 😉 I’ve been salsa-ing quite a lot recently in a bid to eat something healthy but mine always seem to err on the fruity side. A herby one sounds delicious. I’m using up the ones in the freezer before the new season beans come on stream! And I love salsas, so fresh. I’m intrigued now, what’s in your fruity salsas? This week has been a distinctly unseasonal mango and avocado with lime, chilli and coriander. Oh, that sounds wonderful. Yum. This looks absolutely gorgeous – I’d order it in a restaurant in a flash. Perfect spring fare, Linda, should organize some lamb for the weekend. Broad beans are a constant in our freezer, too. What would happen if one were without? 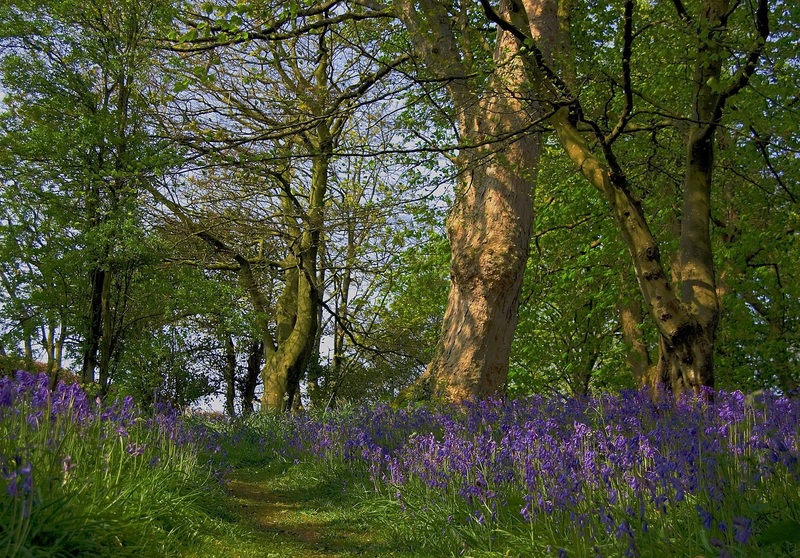 I adore the bluebell way and the anchovy picture equally. 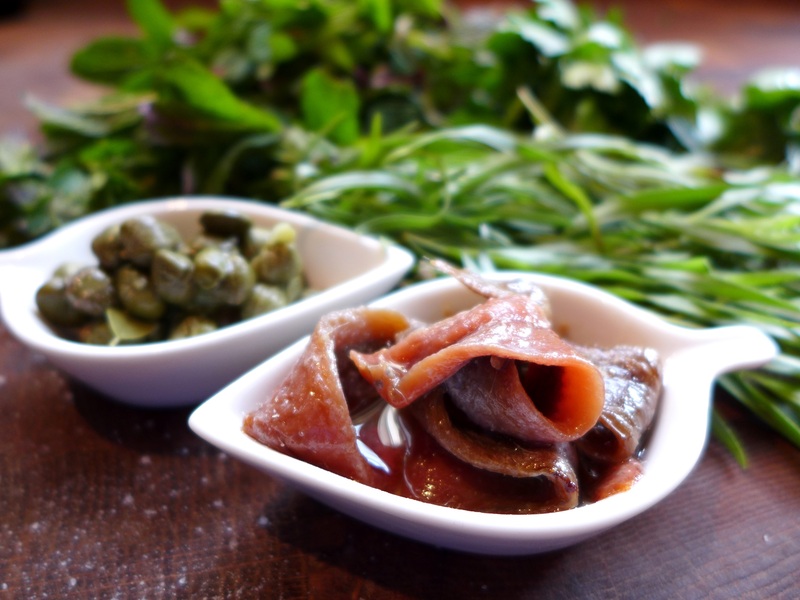 I love salsa verde and I love tarragon ….what a great combination . You created a delicious spring meal. The salsa is something I must try! Makes my mouth water just reading the ingredients. I love lamb and often cook shoulder chops in various ways–the salsa would brighten the meal. (The initials–Shirley Anne–never wanted to go by Shirley since I had male relatives by than name. I opted for Anne, but so many places insisted on first name that I just started using the initials. Anne works well–FB wouldn’t accept that though. How strange they are sometimes. Anne it is, thank you. Thank you, Mimi, that’s really kind. Glad you approve!